The Essa Stallions are back-to-back CPJHL Champions! After taking game #1 Saturday night in Essa by a score of 6-1, The Stallions headed up Highway 11 to Gravenhurst, ON to take on the Muskoka Anglers in game #2 Sunday afternoon in the CPJHL Presidents Cup Finals. Whoa Nelly did the Stallions ever come to play! The Stallions withstood the initial push from a fiesty Anglers team lead by Captain Brett Machin. But at the 5:54 mark of the 1st period, Defenseman Samuel Muir snapped a pass from just inside the Stallions blue line to streaking winger and league scoring leader Tim Holmstrom who would go in and make no mistake, snapping one by Anglers goaltender Ethan Messner. 1-0 Stallions would be the score at the end of the 1st period. 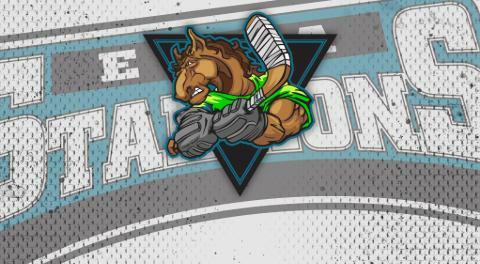 In all, that 1-0 goal by Holmstrom would count as the game,series,and presidents trophy winning goal as the Stallions would erupt for 7 more goals along the way, taking game #2 by a score of 8-0 and the series 2-0!! Ethan James would stop all 27 pucks that were shot his way, for a shutout to complete another standout season for the keeper from London, England. This is the 2nd straight season the Stallions hoisted the CPJHL Presidents Cup Trophy, as they become the first club in the leagues history to win back to back championships! "I am so proud of all of our guys. We saved our best game of the season, for our last. It was a complete team effort from puck drop and I couldn't be happier." said Head Coach and Director of Hockey Ops Sylvain Cloutier. "To be honest with you I'm sort of speechless and just enjoying the moment. It's an unbelievable feeling for this group that worked hard all year long, and no one else deserves it more than these kids" Cloutier added. "This is a surreal moment for all of us. Players, families, billet families, our scouting staff, coaching staff. All of us. We've been on a roller coaster ride all season. Clouts and I implemented a culture that needed 100% buy in from all parties involved, and they did just that. This is the result of hard work, never giving up, and completing the task at hand. All very cliche statements, but so very true" said General Manager and Assistant Coach David Lang. "The boys worked really hard. Our additions at the trade deadline stepped up in leadership and in key situations. Adding them to the core group of young gentlemen we had put us over the edge, in what we needed to be a championship caliber team" Lang added. With Cloutier and Lang at the helm over the past two seasons, The Essa Stallions have a combined 2 CPJHL Presidents Cup Trophies, a Coach of the Year Award (2017-2018), and a record of 88 wins and 11 losses. An outstanding staff accomplishment no matter the league or level. Wherever you go, wherever you play, always remember...Once a Stallion. Always a Stallion!